Part two is that Sting has consistently challenged genre boundaries, not only by invoking stylistic types at will whenever they serve the narrative purpose of a song’s lyrics—say, the ‘country music’ style of I’m So Happy—but also by using really challenging musical materials, such as composite meters and complex harmonies. These, too, are often related to what a given song is about. A case in point is I Hung My Head, the second track on the 1995 album Mercury Falling, which, Wikipedia tells us, “marked Sting’s transition from heavier jazz-inspired rock to the adult contemporary* genre.” Although the narrative is set in the old American West, the musical style is anything but 19th century: the original setting of the song is built around a heavily distorted electric guitar riff—one whose rhythm is strangely elusive and unsettled. The song is written in compound time 9/8. The curious offbeat rhythm has the effect of alternating 5-beat and 4-beat bars. The drum beat is syncopated, on the 3rd and 8th beats. It’s really unusual. Even in styles where composite meter is fairly normal—say, the Rumanian folk music whose melodies Bela Bartok famously collected, and which so influenced his compositional style—it’s much more common to have the ‘augmented beat’ (the one with three subdivisions) fall at either the beginning or the end of the measure, where its tendency to create an accent makes a great start or ending. Inserted in the middle, it’s unsettling, destabilizing. It’s also appropriate. Like the narrator, we listeners wait for clarity—we, too, have “time to kill.” (An innocent-sounding phrase with a sinister double meaning—“Early one morning/With time to kill” starts first and last verses, framing the entire song.) That ‘time to kill’ is inserted right into the middle of each and every measure for us. That bass line is part of the guitar riff mentioned above, performed on the lowest two strings of the guitar. 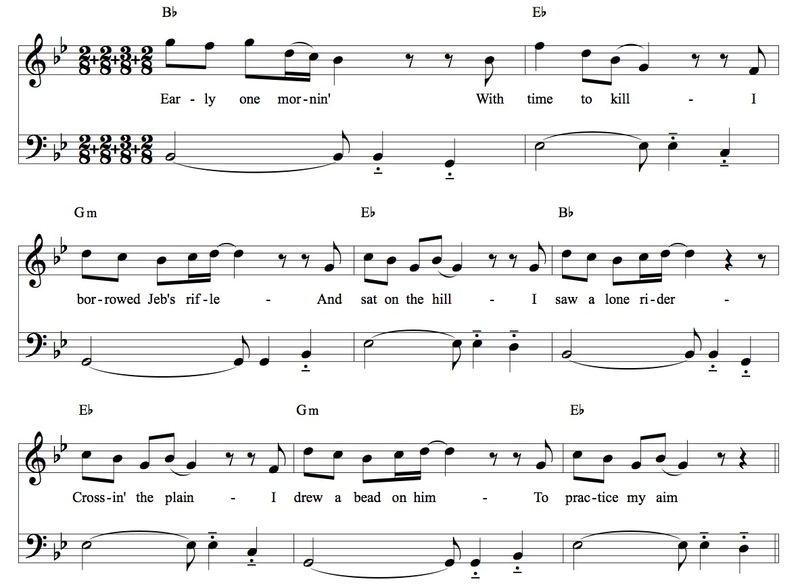 (The higher bits of the riff are omitted from the transcription for clarity.) The accented quarter notes ending each bar help to stabilize the meter, setting up the coming downbeat. But if focused upon—if the listener concentrates on the bass and lets the melody recede into the perceptual background—those quarter notes can induce an alternative metric scheme, a whole new meter. It’s still composite, but now it’s one in which the second beat is the augmented one, and “beat three” arrives not on the 8th eighth note of the measure, but on the 9th. You might say that beat three of the ‘distorted four’ is perpetually disrupted, torn apart, by this conflict between different layers in the musical texture. Again, it’s unsettling, disruptive. And again, it’s appropriate: the whole song revolves around a moment which, ‘inserted’ into the narrator’s life, disrupts it—in fact, utterly derails it. And the metric structure I’ve been describing gives us a compelling analog for that—one that helps us feel imaginatively what is felt by the narrator. In setting a musical text, it doesn’t get much better than that. You can really pick out the bass line; the whole symphonic bass section is playing it. And that guitar riff is still there, if much farther back in the mix. There are a couple of good shots of Dominic Miller, Sting’s long-time guitarist and collaborator, flat-picking it on his white Les Paul. A very interesting alternate version is Johnny Cash’s 2002 cover. In that recording, the characteristic meter is changed to straight 4-4, and the harmonies are simplified as well. Some listeners prefer it; Sting is said to have considered the cover an honor. My take on it is that the unsettled, disrupted quality removed by these changes is taken on by Cash’s vocal performance. Readers here can judge for themselves, if they wish.